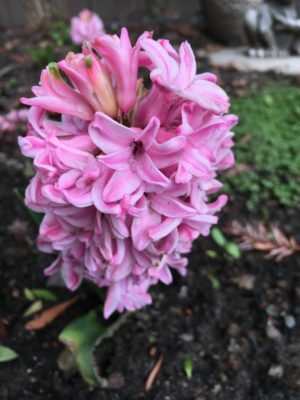 I’m not an in-your-face kind of person, but when it comes to my garden, all bets are off. I just want to grab people by the lapels and go, “Look at my roses! Look at that fuschia! Look at those delphiniums!” And since I can’t do that in real life, I’ll do that here. 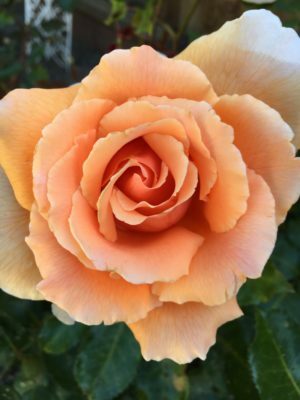 And we’ve got my orange Just Joey roses. Even though the rose pests have been legion this year, it’s doing really well. 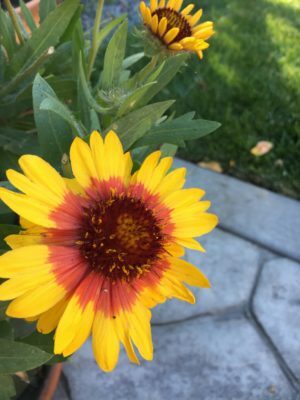 I am madly in love with this yellow flower, which I bought last summer. For the life of me, I can’t remember the name; I think it’s a kind of rudbeckia. 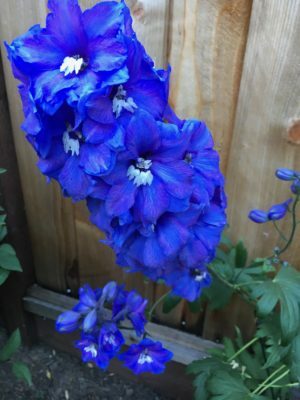 I’ve got delphiniums on steroids this year. I’ve had to stake them, which I didn’t have to do last year. Oh, they are heart-stoppingly gorgeous! 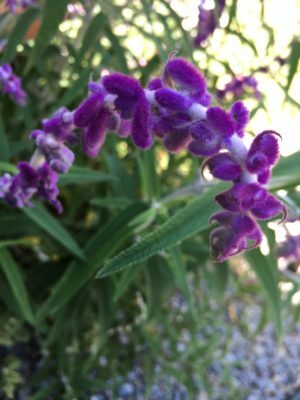 I also have this Mexican bush sage, which is growing robustly in a large pot. It was grown from a tiny little slip my grandmother gave me, maybe eight or so years ago. Grandma is no longer alive to see it, but I suspect she’s smiling on it from that garden in the sky. And I’ll close with this Bewitched rose, just to add a little pink to the picture. 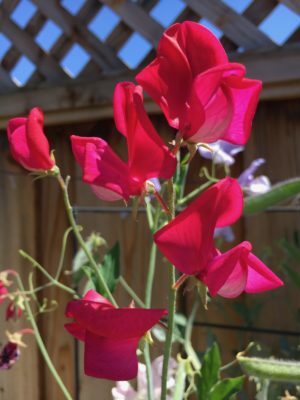 What is YOUR favorite color to have in the garden? As is the way with gardens, some things have really flourished beyond my expectations, and others have … not. The bleeding heart plant sadly lived up to its name and died pretty quickly (sob). 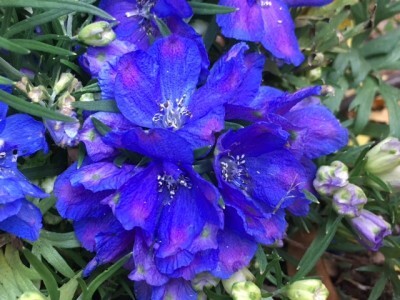 I replaced it with a delphinium, which seems to be thriving. 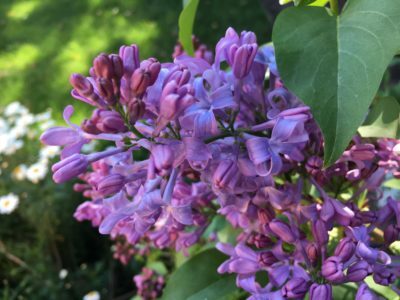 All in all, it’s nice to round out the month of May with such lushness and color. And I think I have Mary’s approval. 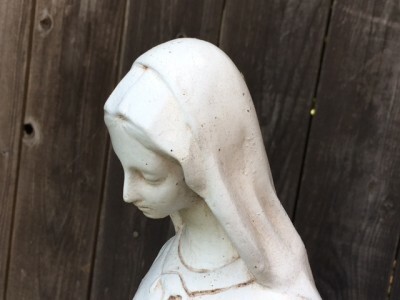 For the past eight years, my Mary statue has been on our old, cracked patio. I would make up for the icky concrete by putting flowerpots at her feet; it looked nice when they were in bloom. But our backyard recently underwent a major and much-needed overhaul. Goodbye, old ratty concrete and ugly podicarpus and oversized palm tree that always had me worried it would collapse on our neighbor’s house in a storm; hello, new lawns and curved flowerbeds and the chance to create an entirely new garden layout from scratch. And there was one feature that was a very, very high priority for me. 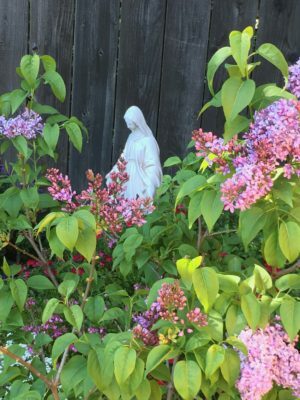 “I’m going to give the Mary statue a special corner in the new yard,” I told my husband. “Nobody puts Mary in a corner,” he said. 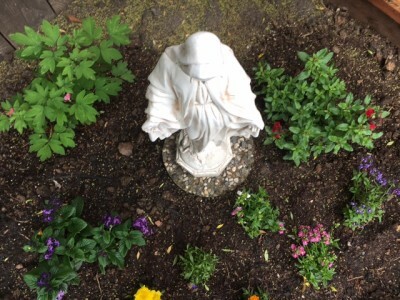 But I did, and earlier this week I planted all kinds of flowers around her. I’m pretty happy with how it turned out. 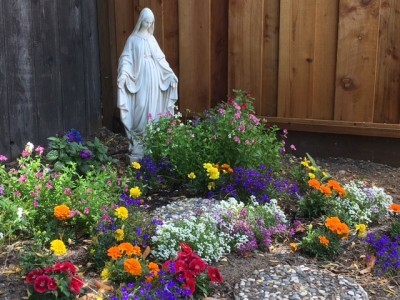 There’s actually a long, long history of Mary gardens in European countries. 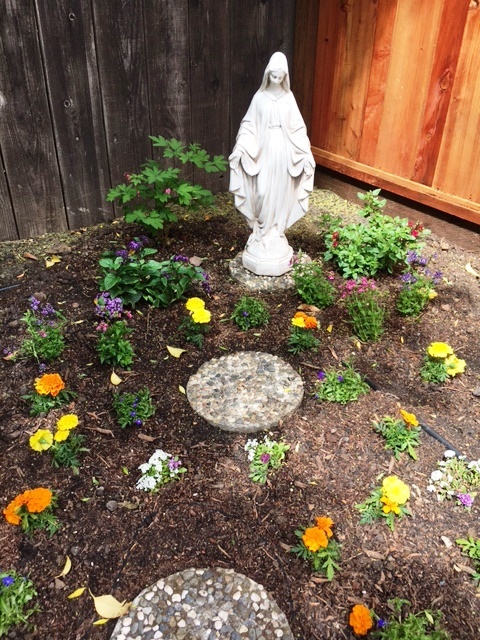 Often you find in them flowers which were named after Mary herself (including marigolds, or “Mary’s Gold”). I included several of those, bright and sunny. 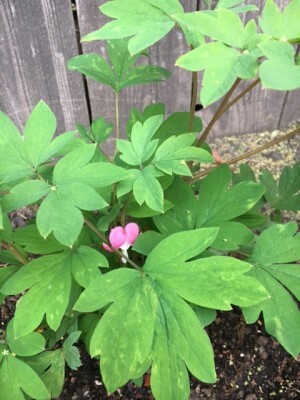 I also found a bleeding heart at a nursery and had to put it in, too (that’s another flower traditionally associated with Mary, for obvious iconographic reasons). Mostly, though, I went for colors I like and flowers that I thought would do well in our corner. It’ll need a little time to fill in; I’m counting on time and Miracle-Gro to help with that. But it’s a lovely new little space, the focal point of our new yard. 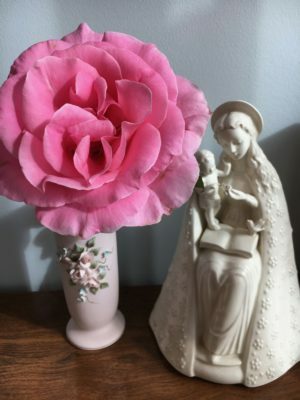 And I think Mary is pretty happy in her own little corner.